If you think Shakespeare is sacred, stay away from the Soulard Theatre, where Hydeware Theatre is skewering two of the Bard's famous tragedies in Ann-Marie Macdonald's Goodnight Desdemona (Good Morning Juliet). 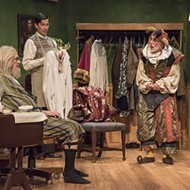 The play is Alice in Wonderland meets A Connecticut Yankee in King Arthur's Court, with modern-day Shakespeare scholar Constance Leadbelly falling into her trash can and tumbling into the worlds of Othello and Romeo and Juliet in search of a possible missing character who might turn both plays into comedies. The evening begins on a promising note. The theater is newly fitted with comfortable seats that surround a thrust stage, on which actors playing the corpses of Romeo, Juliet and Desdemona are strewn while a silent, musing Othello stares at the body of his dead wife. Intriguingly, Desdemona is played by an African-American actress. The opening scene, a "dumb show" that plays and replays the deaths of the characters, ventures boldly into the style of the absurd. Sadly, our interest is lost as the first twenty minutes of the play unfold drearily, with stereotypical doormat Constance letting manipulative Professor Night steal her ideas and stomp on her heart. Some unnecessary speeches about alchemy bog down the action even further (alchemists wanted to turn lead into gold -- here we have Constance Leadbelly looking for a golden discovery in Shakespeare's plays -- could the playwright be more heavy-handed?). When Constance (finally) falls down the rabbit hole into the world of Othello, the scenes turn immediately more interesting, as Macdonald proves apt at twisting the plot unexpectedly. But it's not until Act Two, when Constance (now dressed as a boy) enters the realm of Romeo and Juliet, that Goodnight Desdemona finally kicks into gear. 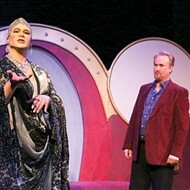 It's hard to dislike a play that offers cross-dressing opportunities for every cast member, and it's in their gender-crossed roles that most of the actors find glints of comic gold. 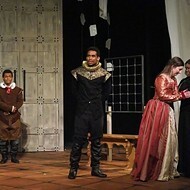 But while the script turns Shakespeare's plays topsy-turvy, the actors show a distracting disrespect (or ignorance) of his language, mispronouncing "cuckold," "gall," "rheum" and "Iago." Much of what might have been humorous in the play is also rendered unintelligible by the actors' runaway-train line delivery. Director Richard Strelinger is at his best with the script's physical comedy, and several scenes of stage combat are humorous and exciting. But the thrust stage is not always well used: In some scenes, not everyone in the audience is able to understand much of the dialogue or see some of the action. 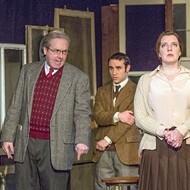 Ken Haller's portrayals of the chorus, servant and ghost were easily the clearest and most interesting moments in the production. The rest of the ensemble -- Jennifer Blankenheim, Percy Rodriguez, Richon May, Wayne Robert Easter and Ellen Clifford -- each had bright moments (mostly in the second act), but too much was lost in their pell-mell punch lines. 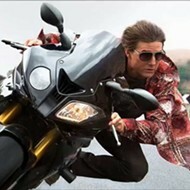 It's frustrating to see actors with such energy and good intentions derailed by vocal pace. Also unfortunate is the noisy heater that occasionally overpowers John Shepherd's driving sound design, which features the Eurythmics and the Beatles. Thom Crain's imaginative costumes add unexpected humor, while Brian Hyde's deceptively simple-looking set proves there's much more than meets the eye. 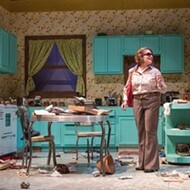 Indeed, the scene changes and lighting effects (designed by Pamela Banning) were more interesting than some of the early scenes in the play. In Goodnight Desdemona (Good Morning Juliet), the main character is searching for a way to turn tragedies into comedies -- or, if you prefer archetypal images, a way to turn the lead of despair into the gold of self-respect. This production delivers the search but not the payoff, finding fool's gold instead of the real thing. But it's hard to dismiss the effort entirely. Hydeware's brash mission statement, declaring an aim to "overthrow the preconceptions of how theatre is experienced" and to "revive theatre as a relevant, powerful force in society," paints the company as a contender willing to take a loss and come back fighting. I'm looking forward to the next round.